When we moved into our 1982-built townhome a couple years ago, there were some major design “no-no’s” going on. I loved the ’80’s as much as the next fella – but there are certainly some things that should have been left there! Among them are shag carpet, floral patterned couches and gold-colored anything (Gag me with a spoon!). So, with a limited budget, the wife and I decided to make a few small home improvements that made a world of difference. The funky chandelier we had hanging in our dining room needed to be put out of its misery. We updated to a brushed nickel fixture that was classy and minimal. For under $100, it not only brightened up the room, but gave the area a much needed update. Speaking of light fixtures – we also changed out the switch plates that were around the house. These included the outlet covers as well. We changed all ours from a yellow-tint to all white. Another minimalist update that didn’t cost an arm and/or a leg. Another huge “dater” of a home is the window treatments. An easy way to bring them into 2012 is to get a curtain rod and some drapes from IKEA or Target. You can get these for a decent price and it will class-up your home in no time. We put a rod and curtain throughout our house and they looked much better than the old and dated blinds. When we moved in – the kitchen had these ugly gold-plated knobs on the cabinets. They really made everything look dreary and old. While some knobs can run a pretty penny – we found some fairly reasonably priced ones at our local hardware store. We chose a brushed nickel look. I can’t tell you how much of a difference this seemingly small change did to the overall look of the kitchen. 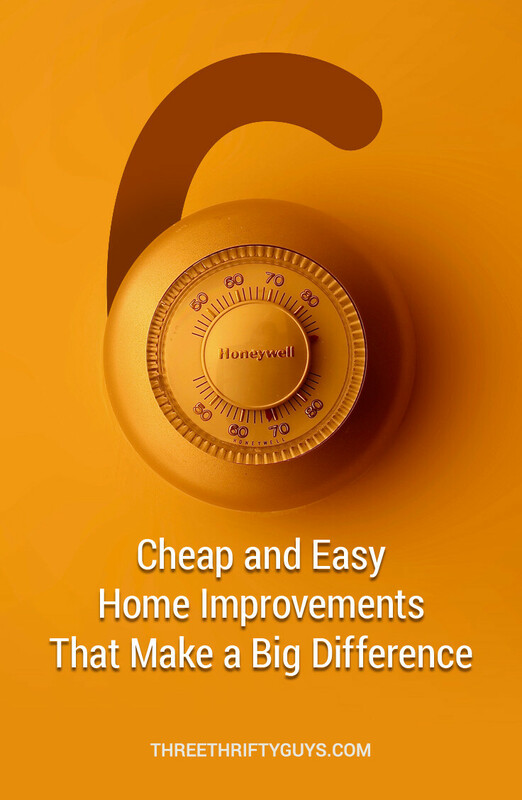 Learning how to replace a doorknob and lockset is pretty simple and replacing doorknobs can also be a good way to change things up on the cheap. Dark brown really has a way of making an already dark house look even darker. That’s what was in our place. So, a change was in order. This is an obvious home improvement and it does wonders to the look of your home. Colors trends still seem to be in the earth tones – so you can’t go too wrong with those. Also, gray seems to be making its way into a lot of decor/furniture (just pick up a Restoration Hardware catalog for reference). The first home I bought was a new construction. But one thing I didn’t like about it was the floor vents. In the kitchen/dining area – on the hardwood floor – they used these cheap white metallic covers. I took them out and replaced them with wood covers that matched the flooring and it made a night/day difference. I know there are other ways to improve your home on the cheap. What have you done to update or “spruce-up” your house? Thanks to your post. It has reminded me about replacing my front door knob. Lost one of the plate screws and after a little while, the inside of the knob is starting to loosen up. It’s one of those cheap newer door knobs. Will definitely go for quality this time. Yeah, sometimes paying more upfront for quality is the way to go. At least, that’s what I’ve found. Yeeeees! A new coat of paint transforms a home like you wouldn’t believe. We painted our home before moving in and it looks much more elegant and, dare I say, fancy? :) Of course, that’s easy to top when the original coat was neon green (yes, actual neon green). Your article gave me the idea to spray paint my existing white metal register covers throughout the house. I used a oil-rubbed bronze color spray paint (with primer in it) and they look amazing!! Thanks for the great tip. This is a terrific blog, full of easy, practical advice. That sounds cool! Thanks for the comment.